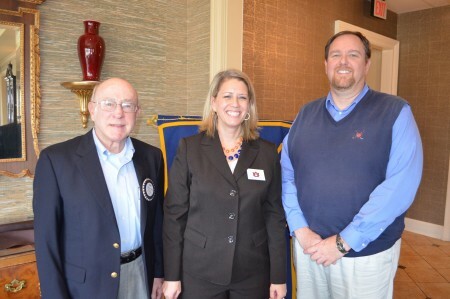 Dr. Jennifer Adams spoke to Auburn Rotarians about recent activities and academic efforts in Auburn University’s School of Communication and Journalism, where she serves as the school’s director. Dr. Adams outlined the advantages to journalism students and the regional news industry of the school’s recent newsroom partnership with Raycom Media, as well as how the advent of the Internet and digital media have influenced traditional print and broadcast media. Pictured with Dr. Adams (center) is program host Herb White (left) and Club President Jim McLaughlin (right).